OCALA, Florida (February 5, 2016) - For the third time in his career and for the first time since 2007, Kraig Kinser found victory lane with the Arctic Cat All Star Circuit of Champions. 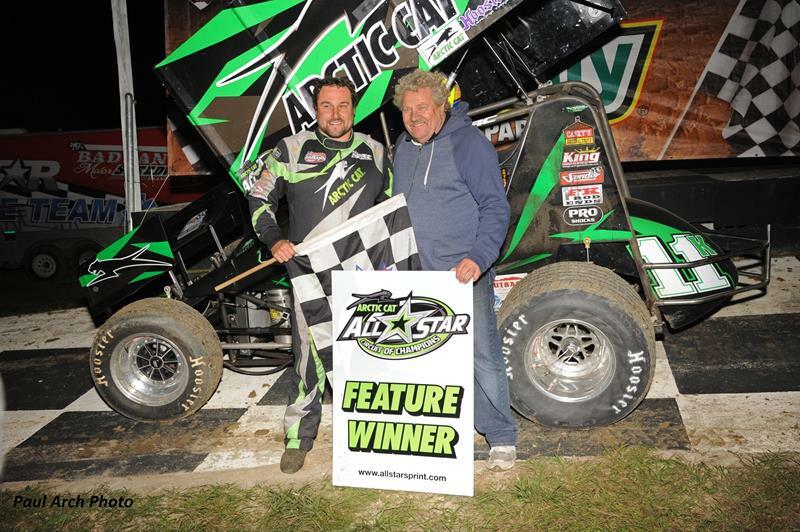 The Bloomington, Indiana, native scored $5,000 for his wire-to-wire triumph at Bubba Raceway Park on Friday, February 5, officially capturing the first Arctic Cat All Star Circuit of Champions win of the 2016 season. Defending All Star champion Dale Blaney finished second, followed by Greg Hodnett, Chad Kemenah and a hard charging Caleb Armstrong. “It always feels great to be in victory lane, no matter where you are at or what time of the year it is” Kraig Kinser said, “The last couple laps, I was really hard on my tires. I knew those guys had to be all around me. I could see guys below me on a few of those restarts. I'm just happy to be standing up here in victory lane." Greg Hodnett and Kraig Kinser led the 24-starters to green during the first Arctic Cat All Star Circuit of Champions main event of 2016. Kinser took command on the initial start and kept control at the front of the field until the main event’s first caution appeared on lap seven. Dale Blaney, who started sixth on the main event grid, worked his way to third before the event’s first pause, with Greg Hodnett riding just ahead in the runner-up position. A caution during the initial lap-seven restart would reset the running order once again. Action would continue following a second lap-seven restart, allowing Kraig Kinser to resume his position at the front of the field. The “Low Rider” Dale Blaney worked his way to second by the tenth circuit of the 30-lap main event, making Kraig Kinser his next intended target. For nearly ten circuits, Dale Blaney and Greg Hodnett attempted to hunt down Kinser through slower traffic, racing within car-lengths and eventually bumper to bumper, but never working around the Arctic Cat, No. 11K. In the meantime, Hodnett would reclaim second on lap 23. Yellow flag conditions would return to the speedway on lap 24, bunching the field back together once again. Dale Blaney reclaimed second from Greg Hodnett after the lap-24 restart, but neither had enough time or tire to catch Kraig Kinser. The Arctic Cat All Star Circuit of Champions will conclude their Bubba Army Winter Nationals campaign at Bubba Raceway Park on Saturday evening, February 6. Like Friday night, teams will participate in a full Arctic Cat All Star program, capped off with a $5,000 payday. Pit gates are scheduled to swing open at 3 p.m. tomorrow afternoon, with hot laps hitting the speedway at 6 p.m., followed by racing at 7 o’clock. Main grandstands will open at 4:00 p.m. sharp. Additional news and information regarding the Bubba Army Winter Nationals at Bubba Raceway Park, including ticket prices and schedule of events, can be found on the Web at www.bubbaracewaypark.com.